The 68th World Health Assembly (WHA), which took place from 18-26 May, was characterised as one of the most successful annual assemblies ever by Margaret Chan, World Health Organization director general. From the standpoint of intellectual property, access and innovation, this may be debatable. Below is a guide to the main accomplishments highlighted by Intellectual Property Watch. These include: action plans to fight antibiotic resistance and to boost vaccinations, extension of the Global Strategy and Plan of Action on Public Health, Innovation and Intellectual Property (GSPA), incremental progress on alternative research and development for neglected diseases, status of the pandemic influenza preparedness framework, response to emergencies like Ebola, and WHO’s relationship with lobbyists and donors. “You can be proud of the outcome of the 68th World Health Assembly,” Chan told the closing ceremony yesterday. “This health assembly has produced some landmark resolutions and decisions that are very important for global health and development for long time to come, and of course, for the future of WHO,” she said. “You have given me very clear support for my agenda for change in health emergencies,” she said. “You have also approved the programme budget for 2016/2017.” The WHO is “fully aware that budget approval comes with high expectations for changes and [to] bring measurable results to your people,” she added. The WHO Consultative Expert Working Group on Research and Development: Financing and Coordination (CEWG) was set up to find ways to fund R&D to find treatments for diseases predominately afflicting poor populations. The CEWG report included a proposal for a voluntary pooled fund that would focus on the development of effective and affordable health technologies for such neglected diseases. The WHA took note of the report [pdf], which states that the WHO Joint Coordinating Board of the Special Programme for Research and Training in Tropical Diseases (TDR) will be responsible for the oversight of the funding mechanism. The majority of funding being sought will go toward “demonstration” projects on R&D financing. TDR also will oversee a Global Observatory on Health R&D, which WHO said last week is expected to launch in January 2016 (IPW, WHO. 24 May 2015). This year’s Assembly approved a resolution [pdf] to extend the timeframe of the plan of action from 2015 to 2022. It also extends the timeframe of an overall programme review of the global strategy on its achievement, remaining challenges and recommendations on the way forward (IPW, WHO, 25 May 2015). 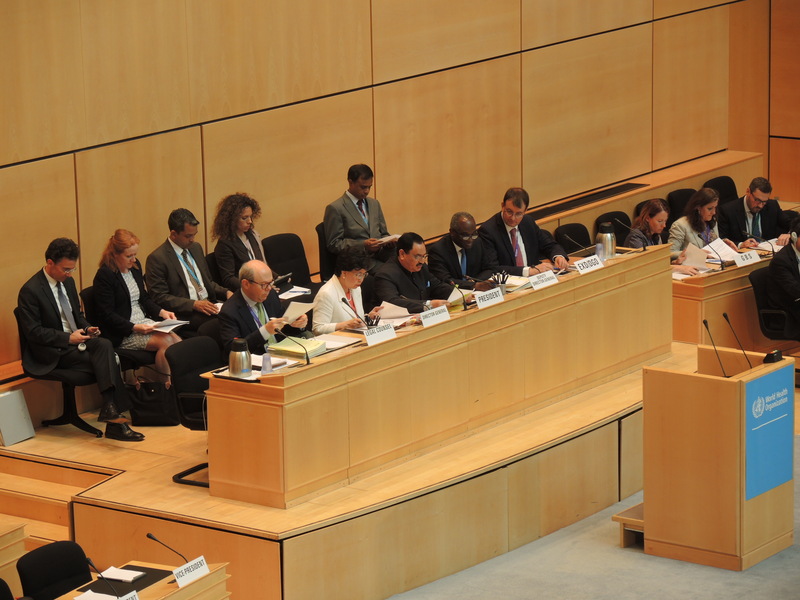 The resolution asks that the final report of the overall programme review to be presented at the 71st WHA, in 2018. The WHO is expected to present the terms of reference of the overall programme review for approval by the Executive Board in January 2017, and to present the composition of the overall programme review panel for consideration of the EB Bureau in February 2017. According to several sources, issues that kept delegates in informal discussions included the sequencing of the review process of the GSPA and the selection process for the experts to conduct the programme review. According to the report, the global vaccine production capacity rose from 500 million doses in 2006 to 1500 million doses in 2013, and a projected 5000 million doses by 2016. “Several agreements have been signed with academic and scientific institutions and negotiations are under way to conclude additional agreements,” the report said. During the WHA some member states called for accelerated negotiations on SMTA2, and commented on the issue of genetic sequence data and how to include them in the PIP framework, which currently deals with biological materials. Some member states, such as Indonesia and the United States, said member states should be involved in the review of the framework in 2016. The WHO secretariat said the issue of genetic sequence data is a difficult issue and work is ongoing on how to handle information instead of virus in the context of the PIP framework. The Advisory Group of the PIP framework has established a Technical Expert Working Group on the matter, according to the report. The member state mechanism on substandard/spurious/falsely-labelled/falsified/counterfeit medical products (SSFFC) was established in 2012 by WHA decision 65.19, and seeks to help countries fight substandard and fake medicines. The mechanism was expected to be reviewed by the WHA after three years of its operation. The WHA took the decision to postpone the review until 2017, answering a request by the third meeting of the member state mechanism, which met in Geneva from 29-31 October 2014 (IPW, WHO, 22 May 2015). Developing countries and civil society organisations, such as Médecins Sans Frontières (MSF, Doctors without Borders), have called for more transparency in vaccines prices, and for more affordability of vaccines in low and middle-income countries, faced with rising costs of vaccination. The Global Vaccine Action Plan (GVAP) assessment found that the implementation of the action plan was “far off-track” in some areas. The WHA adopted a resolution [pdf], originally proposed by Libya and aimed at reducing vaccine prices and increase availability in developing countries (IPW, WHO, 19 May 2015). The resolution [pdf] underlines the importance of competition to reduce prices and the need to expand the number of manufacturers, in particular in developing countries, in particular to enhance competition (IPW, WHO, 25 May 2015). The resolution asks member states to provide vaccine price data to WHO for publication, to increase affordability through improved price transparency. The WHA this year was expected to approve a framework setting rules for WHO engagement with actors such as industry, foundations, and civil society organisations. Debates have been ongoing about the involvement of the private sector, foundations and other stakeholders, in particular through the financing of certain programmes at the WHO, and the undue influence they might have on the organisation. Despite numerous drafting sessions during this week’s WHA, WHO delegates were unable to complete work on the draft framework and the WHA adopted a resolution [pdf] requesting the WHO to convene “as soon as possible and no later than October 2015, an open-ended intergovernmental meeting to finalize the draft framework of engagement with non-state actors on the basis of progress made” during this Assembly. The finalised draft framework is expected to be adopted at the 69th WHA in May 2016. The resolution also requests that WHO develop a register of non-state actors in time for the 69th WHA. The WHO has been under fire for its response to the Ebola outbreak last year. In January, the WHO Executive Board met in special session on the issue. The WHA considered the preliminary report [pdf] of the Ebola Interim Assessment Panel, and requested that the panel continue its work as mandated by the EB special session and to issue a final report to the director general no later than 31 July 2015. The WHA welcomed the director general’s proposal “to establish a small, focused expert advisory group to guide and support the further development of reform of WHO’s work in emergencies with health consequences.” The WHO is expected to report on progress to the 69th WHA in May 2016. The global action plan on antimicrobial resistance aims at finding solutions to the growing problem of bacteria becoming resistant to currently available antibiotics, with the risk of sending the world back to pre-antibiotic era. The resolution [pdf] on resistance to antibiotics calls on the WHO to work with the Strategic and Technical Advisory Group on antimicrobial resistance, member states, the United Nations Food and Agriculture Organization, the World Organization for Animal Health, and “other relevant partners” to develop a framework for monitoring and evaluation (IPW, WHO, 25 May 2015). The resolution instructs the WHO to develop options for establishing a global development and stewardship framework to support the development, control, distribution and appropriate use of new antimicrobial medicines. The resolution also requests that the WHO provide support and technical assistance to countries, with a specific focus on low and middle-income countries. "World Health Assembly Concludes With Actions On Range Of Issues" by Intellectual Property Watch is licensed under a Creative Commons Attribution-NonCommercial-ShareAlike 4.0 International License.